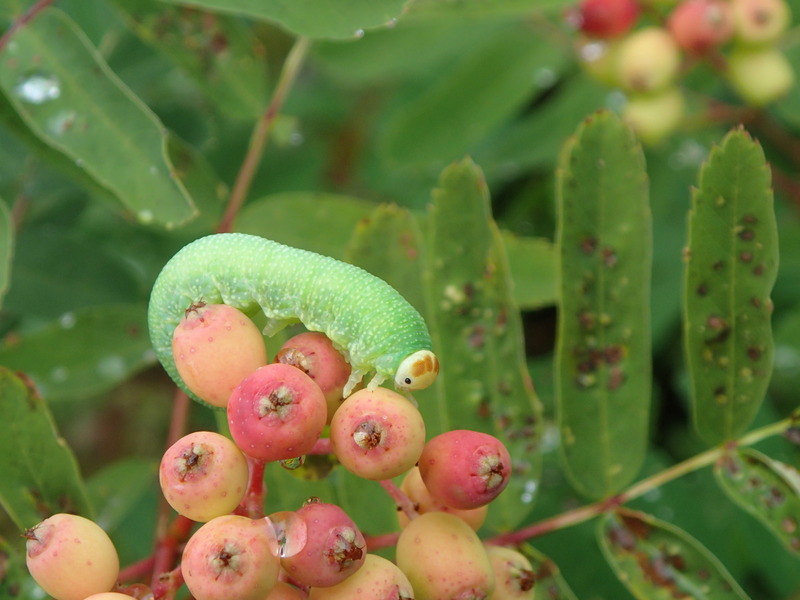 Sawfly larva, Trichiosoma triangulum, found on mountain ash. Pest description and damage Sawflies are members of the Symphyta (horntails and sawflies), a subgroup of the Hymenoptera (ants, bees and wasps). The adults are small, black, fly-like insects that swarm in considerable numbers around host plants in the sun, but the adults do not harm plants. These larvae are caterpillars that are fairly host specific and many get their name from the host plant (i.e. willow sawfly). 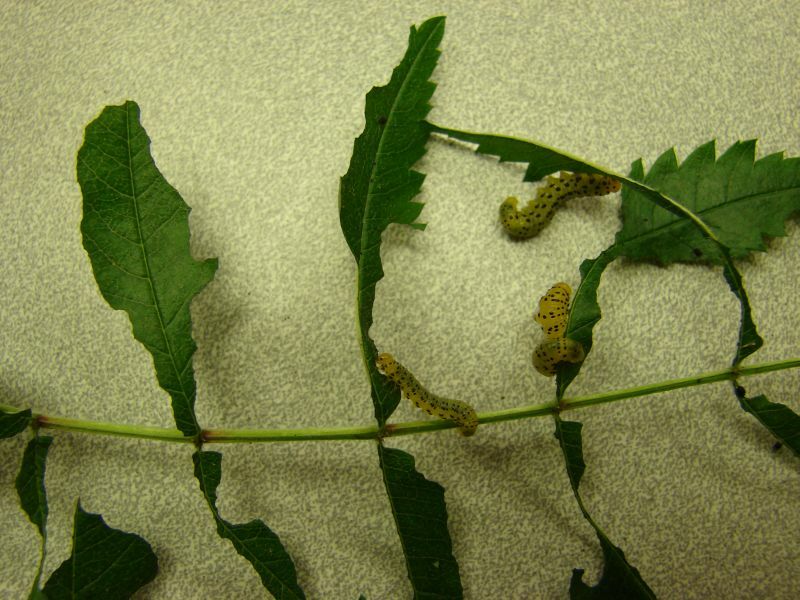 Some caterpillars feed gregariously along the edges of leaves. There are solitary feeders that chew a hole in a leaf and literally march around feeding inside the hole as they walk. Sawflies differ from moth and butterfly caterpillars in that they have seven or more pairs of prolegs, and many carry their hind end curled back over the body in the shape of an "S". Many sawfly larvae are often quite visible, while others match the edge of the leaf so closely that they seem invisible. There are also sawflies that bore into fruit and wood as well as those that mine leaves or live within plant galls. Adult female sawflies have a small saw-like ovipositor that is used to insert eggs into leaf or stem tissue. Eggs, inserted into small slits in leaves are visible as little raised welts or blisters. Some members are called slugs because they are covered in a slime which protects the larva. These slug-like caterpillars skeletonize leaves by removing the surface leafy tissues and leaving behind leafless stems with only the petiole and midrib remaining. Biology and life cycle Sawflies have complete metamorphosis (egg, larva, pupa and adult). Adults are the mobile stage for dispersing and meeting mates. Often the larvae eat fast and drop to the soil before they've even been noticed. There may be one or five or more generations in a season. Most species of sawflies overwinter as pupae in soil. Pest monitoring Use yellow sticky traps to monitor adult sawflies. Watch for the appearance of the eggs clustered in little "pita pocket" slits in the leaves or for droppings on underlying leaves. Look for the gregarious larvae lining the leaf edge, or leaf damage along the margin. Leaves, chewed so thoroughly that only the midribs remain, are diagnostic for sawfly damage. Watch for future generations. Pick off larvae or possibly hose plants with a strong stream of water. Common predators include general bug predators.